I go to bed late and I get up early, and a lot of the time because of my schedule, I do not eat dinner until 10 p.m. That is why I have nutty dreams. 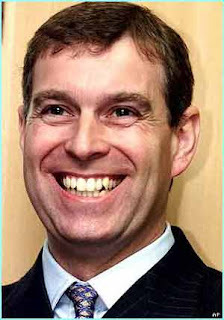 Last night through unforeseen circumstances I ate very late and I dreamed I was in England, being chased by Prince Andrew! I know, it makes no sense. Married, Latin Mass-attending, Leonard Pennario-listening music critic from Buffalo, must have! Even in the dream, I puzzled over that. I have been good about doing my Zumba but still. In the dream Howard and I were over in England, and we fell in with the prince somehow and before I knew it the prince's people were cornering me and demanding that I go somewhere with him. And they said I might have to stay overnight with him. Howard was just kind of leaving me nonchalantly and I ran after him. "Howard," I remember saying, "make sure you have your phone with you, OK?" The phone is a weird recurring theme in my dreams. I am always trying to call people and I can't dial the number, or the call does not go through, or the person does not answer. So naturally in the dream Howard just walks away. So there I am stuck with Prince Andrew. And even worse, I am wearing these tattered jeans! We passed a street stand with these hippie clothes, which I have always loved. I stopped, thinking, I could at least find a skirt to pull on, or something. But Prince Andrew grew impatient and his handler whispered to me I had better hurry up. Then the clothes began disappearing before my eyes! Not only was I irritating Prince Andrew but I was going to leave the stand empty-handed! Here is one other funny thing: I was thinking, maybe I could deal somehow with this overnight business. Perhaps I could stay over and Prince Andrew and I could be, uh, just friends. Because I thought it would be cool to stay overnight in Buckingham Palace. Or Balmoral, which also surfaced in the dream as a possibility. It is funny, waking up from a dream like that. The dream was stressful and messy and in a way you are happy to leave the situation. On the other hand, who wants to go to work? The picture you have of HRH Andrew looks a lot like the character Andy Bernard on "The Office"
Ha, ha! I picked it out for his big grin.